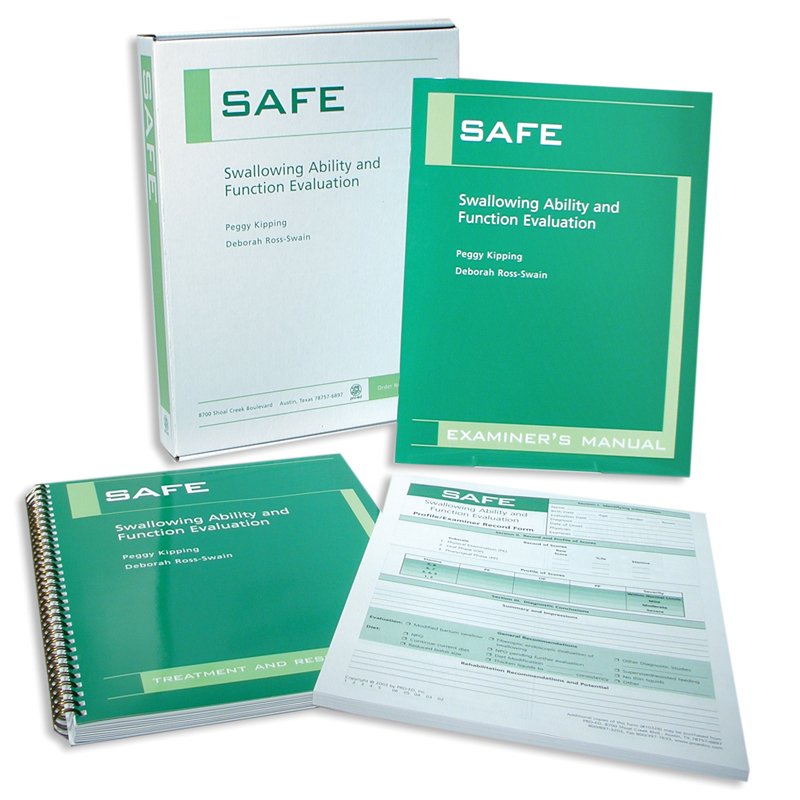 SAFE: Swallowing Ability and Function Evaluation KIT Peggy Kipping • Deborah Ross-Swain : LinguiSystems, Inc. The SAFE provides clinicians with a carefully standardized, efficient, and comprehensive way to evaluate swallowing. This test is based on the findings of the latest research in swallowing disorders and the practical needs of therapists conducting such assessments. It is designed to assist in providing a definitive diagnosis or label of dysphagia. Its results help generate treatment plans or suggest the need for referral to other professionals for further assessment. The final diagnosis of dysphagia is usually made after careful review of the patient's medical chart and history, results of the SAFE, and any other recommended testing. The SAFE's primary focus is on the oral and pharyngeal phases of the swallow. Before administering the SAFE, you should obtain a case history and interview the patient and /or caregiver. Evaluation of General Information Related to Swallowing Ability In the first stage, observations are made regarding pertinent cognitive and behavioral factors that could impact the patient's ability to safely and efficiently manage the swallow. These observations are used to judge whether the patient's cognition and/or behavior impacts his or her ability to effectively manage oral intake. A patient's cognitive status and behavior have an impact on the determination of appropriate therapeutic interventions, and have been included in the SAFE for that reason. Physical Examination of the Oropharyngeal Mechanism In the second stage, the patient's oropharyngeal mechanism is evaluated using a series of prescribed movements. Diagnostic observations regarding the structural integrity and sensory acuity of the oropharyngeal mechanism are also made during this stage. In the third stage, the patient's ability to efficiently, effectively, and safely manage the oral preparation phase, oral phase and pharyngeal phase of the swallow is evaluated. The diagnostic observations made during this stage are to determine whether the patient's tolerance for various food and liquid consistencies is within normal limits or problematic. The SAFE has four principal uses: (1) to identify specific problems occurring during the oral and pharyngeal stages of swallowing, (2) to develop recommendations regarding treatment plans, (3) to make periodic reevaluations and assessments of progress in therapy, and (4) to serve as a research tool. Secondarily, its results can also be used to determine the effectiveness of various interventions on test performance. The SAFE provides qualified health care professionals with a standardized protocol for the clinical or bedside assessment of dysphagia. Examiners using the SAFE should already be familiar with and skilled in evaluation, management, and safety precautions relative to patients with swallowing disorders. This instrument can be administered quickly, yet it provides a comprehensive picture of a patient's current level of swallowing ability.